We’ve all watched awards show where the famous celebrity laments that they can’t properly thank everyone who contributed to their success? I feel that way just a little about this fig dish. Not that it will win any awards (although you never know). Suffice it to say I don’t expect to be teetering on too-high heels toward a stage lit to resemble the sun whilst sewn into an inappropriate dress any time soon. Even so, the inspirations for this post were so varied and many it’s worth dwelling on them just a bit. Back at the beginning of summer I had the marvelous opportunity to enjoy a dinner at the nationally-acclaimed Olivia restaurant with the also nationally-acclaimed — and oh so very fabulous — Mollie Katzen, all courtesy of California Walnuts. When I received the invitation to the dinner I jumped at the chance to attend because Chef James Holmes’ cooking is a real treat, I’m a huge fan of Mollie’s, and I love walnuts. As a source of healthy fat and protein they are hard to beat. So it was a trifecta of admiration on my part and the evening was all I expected and more. I sat across from Mollie and we talked about what seemed like every topic under the sun, from the role food bloggers play in the food world to education funding and how hard it is to raise kids. Woven throughout the lovely evening of conversation was a collection of one-of-a-kind walnut dishes prepared by Chef Holmes. What I learned from the chef that night is that the applications of walnuts are seemingly endless and I need to think about them as more than the crunch factor in a cookie or a healthy addition to a salad. Fast forward a few weeks later to my long over-due trip to Monument Cafe and the Monument Market in Georgetown, Texas, just a short drive from Austin. The cafe has been open for a while now and many of my food blogging friends have had nice things to say about it. The cafe is a quirky cross between an old-school diner and an upscale restaurant. The food is very much diner food although it’s locally sourced and much better than your typical greasy spoon. The interior is accented with dark cherry and leather and the waiters all dress, and have the demeanor of, those you would find in a find dining establishment. It’s a bit of a trek for Georgetown residents to find their way to the farmers markets in Austin, so the owners of Monument started one right behind the cafe. Given their strong relationships with local growers, setting up a market was a natural extension of their restuarnt. Besides carrying local produce they have meats from reputable, sustainable growers, and artisan goods like small batch jams and preserves made by my friend Stephanie of confituras. 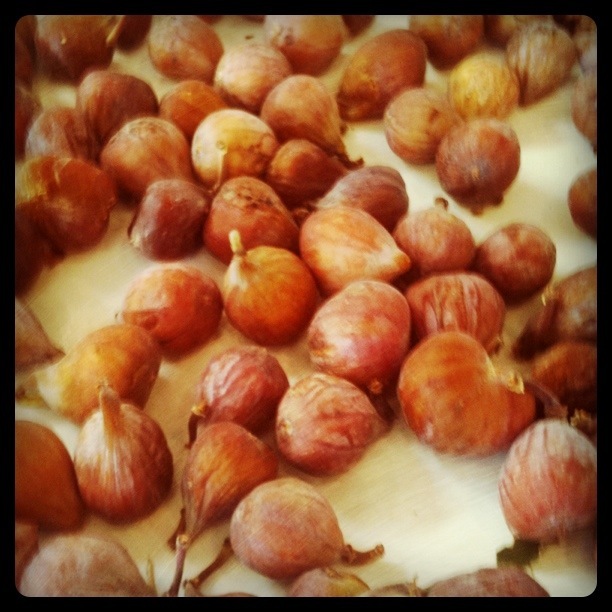 While we were browsing the market I came across these tiny figs and just had to have them. They were fresh and sweet and just begging to come home with me. And finally, speaking on confituras, the fig and walnut conserve Stephanie made last year and that I’m hoarding several jars of my pantry was the last inspiration for this dish. She comes up with the most unexpected flavor combinations and they are always tasty. As I was standing in my pantry trying to decide what to do with the figs, I saw a jar of conserve and I was almost there. I’m happy to report the addition of the blue cheese was all my doing. I’ve come to love sweet and salty combinations and I knew the super-sweet figs would need a strong salty partner to balance them out. I initially thought of goat cheese but I decided a stronger blue would help create a mellow bite in the end (how’s that for counter-intuative). So there you have it, a dish inspired by many of my food adventures, which is what those adventures are all about, right? Now where’s my little golden statue? Add the cream cheese and blue cheese to a small bowl and stir with a spoon until nicely combined and mostly smooth. Put a little elbow grease into it. Toss the walnuts into the cheese mixture and stir until they are well incorporated. Using a paring knife or other sharp small knife, cut a deep X into the bottom of each fig. Be careful not to go all of the way through to the stem. Gently squeeze the middle of the fig, just below where the cuts end to force the fruit up and out. The resulting fig flower will look much like a tulip and with red center. Make yourself a whole bouquet of fig flowers and set them aside. Spoon the cheese and walnut mixture into the bottom of a small zip-top bag. Snip a tiny corner off of the bag and squeeze the cheese mixture down until it just starts to come out of the open corner. Fill the center of each fig flower with a dollop of the cheese and walnut mixture. The size dollop will have a lot to do with how big your figs are. You want the mixture to come to the top of the fig but not be overflowing. Plate and serve. Or you know, eat them right off of the plate as you stand there in your kitchen. The number of figs this recipe makes is all about the size of the figs you buy to get to 5-6 oz. I bought tiny figs, some just a little bigger than a thimble, and got 24 figs out of it. If you buy giant figs you may only have 5 or 6. Be sure to use a creamy blue cheese such as Point Reyes Blue or even a blue goat cheese like the Hopelessly Blue made right here in Central Texas. Avoid blue cheese crumbles because they won’t blend as nicely and your cream will be lumpy. Grind the walnuts up well. You want to avoid large chunks because they will clog up your piping bag, and no one likes a clogged piping bag. You can make the cheese mixture the morning before you plan to serve these and the stuffed flowers up two hours before. Cover the cream-filled figs with some saran wrap and store them in the refrigerator until you’re ready to serve them. If you aren’t up for channeling your inner florist and crafting a slew of fig flowers, never fear. Think crostini instead.Brush 10-12 slices of french bread with a nice coating of olive oil and bake them at 400 degrees for 6-8 minutes or until they start to turn light brown around the edges. Or better yet, grill them! Cut each fig in half, or if they are are realy big, into three or four slices. 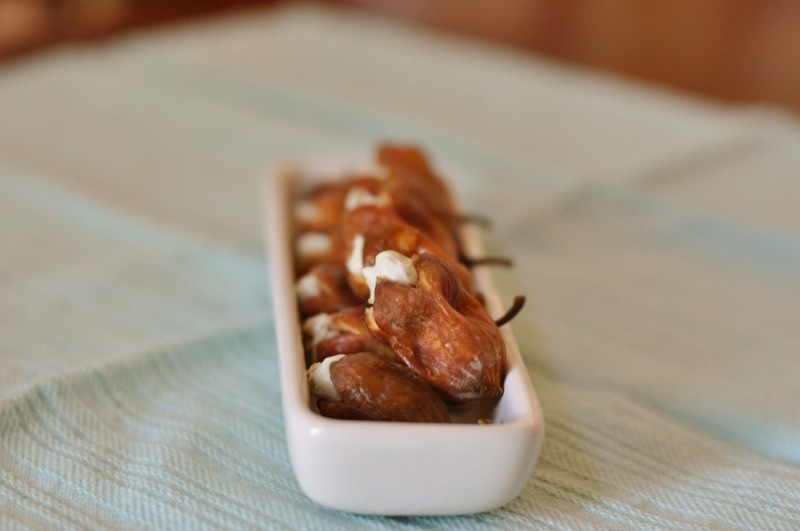 Spread a healthy schmear of the blue cheese and walnut cream on each crostini and top with 2-3 pieces of fig.